Want to be notified of new releases in django-oscar/django-oscar? Upgrade tests and docs requirements. 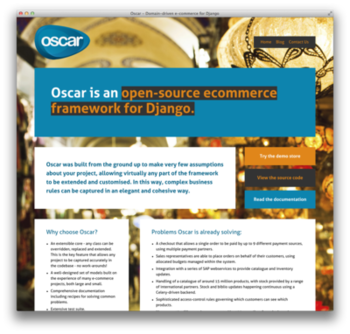 Oscar is an e-commerce framework for Django designed for building domain-driven sites. It is structured such that any part of the core functionality can be customised to suit the needs of your project. This allows a wide range of e-commerce requirements to be handled, from large-scale B2C sites to complex B2B sites rich in domain-specific business logic. These are screenshots from the 'sandbox' example site that ships with Oscar. It sports a simple design built with Twitter's Bootstrap and provides a good starting point for rapidly building elegant e-commerce sites. The sandbox site is also available to browse at https://latest.oscarcommerce.com. 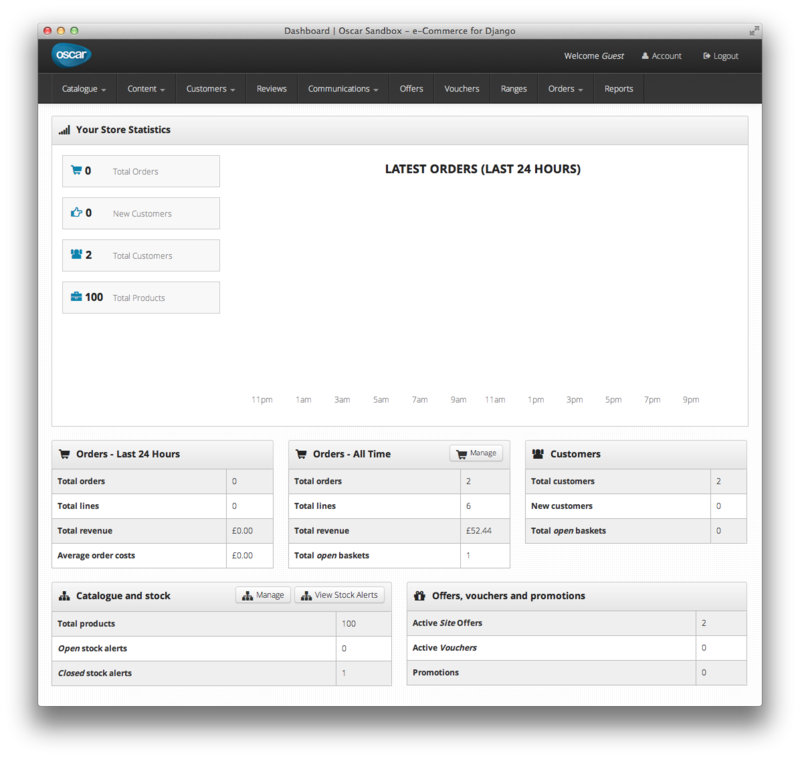 Dashboard users can be created using this gateway page. The sandbox site can be set-up locally in 5 commands. Want to make changes? Check out the contributing guidelines. django-oscar-paypal - Integration with PayPal. 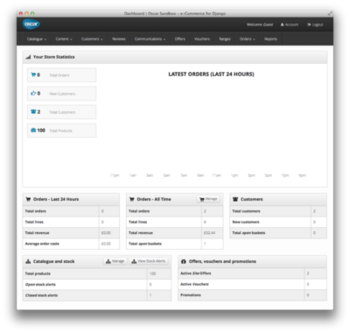 This currently supports both Express Checkout and PayFlow Pro. django-oscar-eway - Integration with the eWay payment gateway. django_oscar_docdata - Integration with Docdata payment gateway. django-oscar-api-checkout - Oscar API Checkout is a layer on top of django-oscar and django-oscar-api, adding support for more complex and multiple payment options during an API checkout. django-oscar-bundles - Oscar Bundles adds multi-product bundles to django-oscar. django-oscar-bluelight - Bluelight Specials is a layer on-top of django-oscar that adds support for more complex offers and vouchers, including conjunctive and disjunctive compound conditions. django-oscar-cch - Oscar CCH is a plugin for django-oscar adding support for calculating taxes using the Wolters Kluwer CCH Sales Tax Office SOAP API. 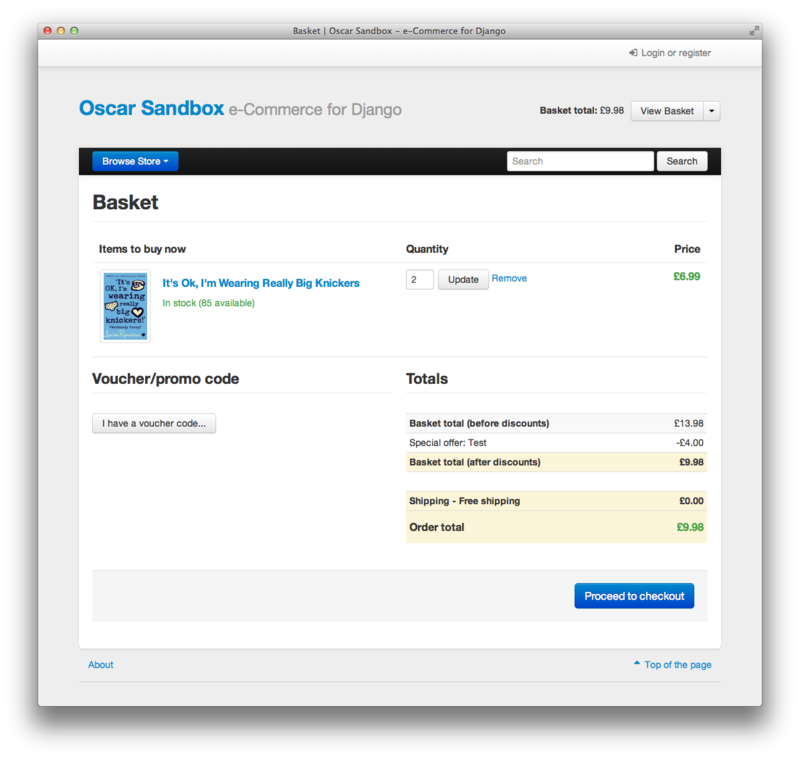 django-oscar-cybersource - Oscar CyberSource is a plugin for Oscar API Checkout that makes it possible to use CyberSource Secure Acceptance Silent Order Post as an order payment method. django-oscar-wfrs - Oscar WFRS is a plugin for django-oscar-api-checkout that makes it possible to use Wells Fargo Retail Services as an order payment method. Let us know if you're writing a new one! 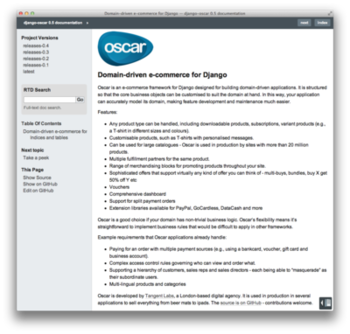 Oscar is released under the permissive New BSD license (see summary). Oscar is still in active development but is used in production by a range of companies, from large multinationals to small, boutique stores. 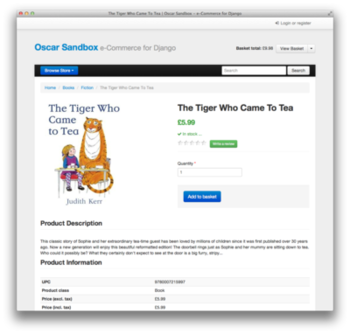 See http://oscarcommerce.com/cases.html for an overview. Many more on the way. If you use Oscar in production, please let us know. 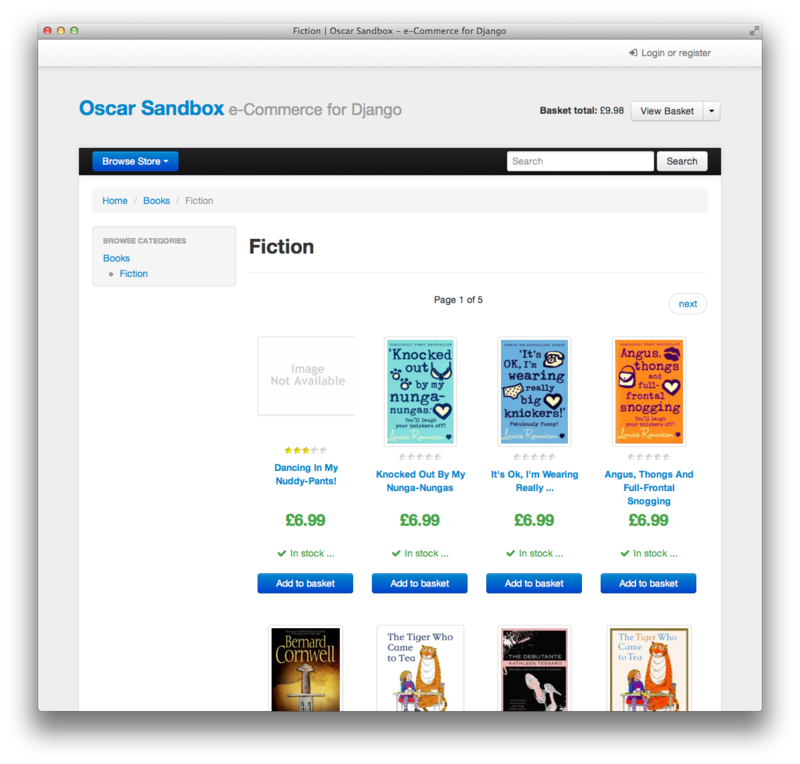 If you are interested in having an Oscar project built for you, or for development of an existing Oscar site then please get in touch via info@oscarcommerce.com.